For a long portion of development, levels in Wingman were all of these things, with very limited contribution to the feel of the gameplay. Players would start the match, and hazards would gradually become more dangerous as players fought in a Super Smash Bros.-esque battle where death was greeted with a timely respawn and your opponent re-positioned for a better shot. And it was fun, to an extent. But when playtesting invariably showed players churning out quickly, we had to discover where the excitement was lacking or – as it sometimes turns out – too excessive. After some brief discussion, the team and I hypothesized that one of the churn factors in Wingman was its pace, which required players to move and shoot nonstop for 2-5 minutes. Once we committed to testing this hypothesis, we never looked back. In the (infamous) first episode in the Star Wars saga, protagonists Obi-Wan Kenobi and Qui-Gon Jinn found themselves in a fateful battle with the film’s antagonist, Darth Maul. The fight was fast-paced, intense, and sensational. But during this battle something unusual happened: They all took a break. As the fight carried the party through the palace’s generator complex, both sides of the conflict found themselves suddenly separated by shield doors that kept one another in eyesight but prevented interaction. To me, this scene was weak – and I’ll explain why shortly – but as the moment lingered, each character illustrated a powerful feeling of anticipation. As the shields began to unlock one-by-one, Obi-Wan Kenobi all but crouched into a runner’s stance in preparedness. While the potential of this scene may have fallen a bit short, the moment of respite it created was undeniable. As a matter of fact, we had even seen a small instance of this anticipation in an early prototype of Wingman where an AI vehicle would occasionally find itself stuck behind a revolving wall. Players would notice the helpless AI and charge up a killing blow, and once the wall had moved… .. … Boooom! Firepower would erupt from the cannon’s muzzle at its forlorn victim, securing a game-winning kill in a moment of satisfying payoff! I’m convinced that it’s time like these – when victory is so close you can touch it – that the feeling of excitement should be drawn out with anticipation. The fight scene in Star Wars was important and decisive, but with frequent cuts to the massive space battle above and the Battle Droid army marching against the Gungan resistance, excitement about the lightsaber battle never had enough focus or opportunity to really swell up to its potential. Our goal was to capitalize on the effectiveness of anticipation without diminishing its delivery through distraction. To manufacture this goal we discarded our Smash Bros.-style respawn dynamic in favor of a more common fighting game convention: Now when a player dies, both players are reset and a new countdown begins for the next round. Surely enough, we immediately saw a small increase in retention with new players. They now had several more seconds to contribute social banter, and didn’t have to worry about re-positioning. Instead of forcing nonstop combat, we allowed players to assign their attention as they saw fit during those moments. 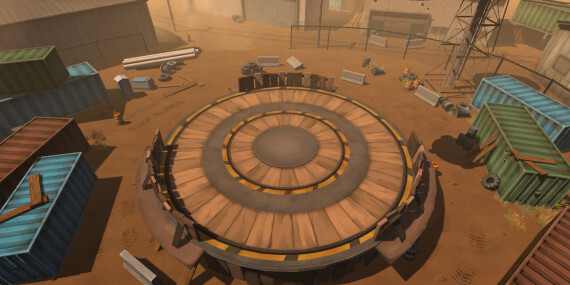 After early kills, players would simply glance away from the screen or take a small verbal jab at their opponent. But near the end of the game – when the victory was in somebody’s grasp – these moments of respite created visible player anticipation to finish the match off. 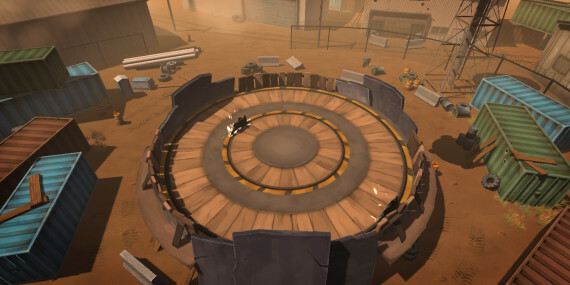 When the match first begins, the level presents a simple interface: a circular arena with three spaced-out walls for edge protection. Simply shoot your opponent into one of the three open gaps around the arena’s edge and you’ve secured a victory. This is intended to generate low intensity. After the first kill, the arena is adorned with a sawblade that navigates in a circular pattern. This dynamic element introduces another win condition while also bringing more motion and life to the static arena. Following the theory that ambient motion in levels correlates with intensity, we wanted to introduce yet another dynamic element. For both budget and readability concerns, we decided to introduce another identical sawblade on a separate circular track. Once both sawblades were moving, the gameplay was noticeably more intense. In matches where one team would completely shut out another team (3-0), this felt like an appropriate level of intensity for the final round. Embracing the notion that “the perception of danger is just as valuable as danger itself”, our fourth round introduces another element…. safety. The walls – looming slabs of metal that feel like they’re keeping players closer to the saws – are actually keeping players from ring-out deaths, and contribute no additional danger to the match. After the addition of a second sawblade, the walls allowed us to increase the intensity slightly without actually introducing more danger. You’ll also notice that the walls are static, and provide no additional motion during round 4. This is intentional and creates a pause of buildup before everything ignites in round 5. Round 5: Fireworks! Confetti! Giant Electromagnets! 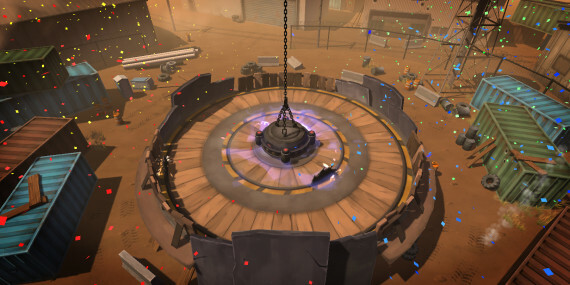 In the rare situation that players find themselves in a well-matched game, they are rewarded with the full-blown sensation of fireworks, team-colored confetti, and one last dynamic element (in this case a giant electromagnet!). The design of these elements is tricky, however. Much like the walls, these elements should minimize any increase in lethality, as players should be allowed to bask in the sensation of the final round, but must also contribute some sort of perceived danger and motion to maximize the intensity. The Eletromagnet’s solution is that it uses a clearly-visible electromagnetic vacuum to pull players slowly towards its center. This makes it slightly more difficult to drive, but has relatively little impact on the likelihood of hitting a sawblade. Combined with the visual activity produced by the confetti and fireworks, the final stage certainly feels incredibly intense without actually being too lethal. Players have universally acknowledged the visual sensation rewarded by a five-round game, and are provenly more likely to introduce a friend to the game simple to introduce those moments. Every time I sit down to play Wingman I still have great moments of anticipation and excitement. Actually playing in a five-round match – while rare – is one of the most rewarding parts of the game and has had a proven impact on player retention. But the game’s retention is still far from perfect. This experiment taught me a lot about how pacing, anticipation, and sensation can help create more memorable moments, but it also reminded me that pacing must continue to be massaged and tuned if the goal is longer play sessions. Consider the act of bringing $1000 to gamble at a casino: you could either spread the money out casually over the course of the evening, or you could bet it all on a single hand. Both paths will certainly create a compelling night of satisfying intensity, but only one solution makes for an evening full of activity. It’d be a bit more work to make Wingman‘s pacing work for an entire evening, but thanks to our changes, Wingman is no longer like the $1000 bet.